HLN have recently been appointed as the “Civil & Structural Engineers” on an exciting new scheme as part of Newport City Council’s regeneration project in Pillgwenlly, Newport. HLN are delighted that Vulcan Court has been selected as the Winner in the Small Development of the Year category in the UK Housing Awards 2014. This is HLN’s first multi-disciplinary project to win such a prestigious Award, which involved the refurbishment and conversion of Vulcan House, a Grade II Listed Building into new apartments with further new build apartments constructed alongside, together with associated courtyard parking and landscaping. Bay Associates have recently been appointed as engineers for Phase 1 of the development of Gower College’s HillHouse campus, Swansea, Wales. Phase 1 will be a £11m of academic and leisure facilities serving both the Hill House site and the adjacent Ty Coch campus. The design for the store is contemporary whilst aiming to reflect the character of Coleford through its integration of traditional local materials. The form of the store developed from a desire to acknowledge the topography of the existing site via its mono-pitch roof design, which in turn contributes to the environmental credentials of the store by creating a north light solution allowing daylight into the store without the problems of heat gain and glare. Planning Permission was granted following a Planning Inquiry in October 2013 at which HLN provided primary architectural evidence on behalf of the developer and Tesco Stores Ltd.
Technical challenges include the requirement for a significant highway boundary wall together with drilling /grouting works to potential worked coal seams that underlie the site at shallow depth. Bay Associates have just secured the Civil and Structural Engineering roles for a prestigious new facility at Penrhyndeudraeth Special Educational Needs (SEN) School on the edge of the Snowdonia National Park. The project is due to commence on site later in the year at a value of circa £10m for Gwynedd County Council. HLN architects worked with Wates Construction as construction phase architects on the £2m redevelopment of the Former Brewery , Iron Foundry and center of activity for the Chartist Movement in the 19th Century. The official opening of Vulcan Court took place on 24 Jan 2014. The ceremony included a number of distinguished guest including Huw Lewis AM, the Mayor of Merthyr Tydfil, and Councilor Brendan Toomey Leader of Merthyr Tydfil County Borough Council. 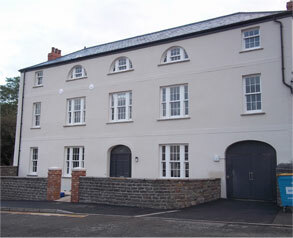 The Wales and Wests 15 unit scheme included a bespoke ground floor flat customized to offer an accessible flat redesigned to the specification for Couples requirements. Congratulations to Richard Thomas on his 25th anniversary at HLN! Congratulations to Richard Thomas on his 25th anniversary at HLN. Richard joined Hoggett Lock-Necrews in January 1989 as a junior architectural technician and has committed himself to the company ever since, working his way up to Associate with the company. The directors of HLN wish to acknowledge and thank Richard for his dedication over the last 25 years. https://www.hlngroup.co.uk/wp-content/uploads/2017/02/HLN-Group-Logo-Homepage1.png 0 0 HLN Group https://www.hlngroup.co.uk/wp-content/uploads/2017/02/HLN-Group-Logo-Homepage1.png HLN Group2014-01-10 12:49:102014-03-31 12:49:33Congratulations to Richard Thomas on his 25th anniversary at HLN! Due to our recent Office Move all direct dials are temporarily unavailable. Please call our mainline switchboard on 0845 375 3298 for all enquiries. We apologise for any inconvenience caused, we hope to resume our normal service shortly. Our Head Office in Cardiff will be moving to our new location on Cathedral Road on the 2nd January 2014. Please also be aware that all of our offices will be closed from Tuesday 24th December until Thursday 2nd January. Please do feel free to contact us on 0845 375 3298 or email us info@hlngroup.co.uk if you require any more information. HLN have been appointed as the Structural Engineers for Phase Two of Cardiff University’s Maindy Park research campus. The Maindy Park campus development lies in the heart of the city and consists of seven phases that will be delivered over the next 15 to 20 years, depending on funding. A £6m investment has been earmarked by the Welsh Government for Phase Two, which will encompass a new building to house the Sustainable Places Research Institute, along with research into the digital economy and high performance computing. The new Medical and Scientific Research and Clinical Facility will contain MRI and Specialist Scanners covering a building footprint of 6000 to 7000 square metres of usable space.